chill with a great view! We are located in Cape Verde in the village Tarrafal in the north of the island Santiago, directly on the Atlantic waterfront. Casa Strela was opened by a Swiss in spring 2013, who’s been living in Cape Verde since years. The Bed&Breakfast offers 4 double rooms, a large living room, TV lounge, library, common kitchen and a wonderful roof terrace. You can enjoy a rich breakfast on that terrace with fantastic view to the Atlantic Ocean, the waves, and on clear days even to the island of Fogo. There is hot water and free WIFI internet in the whole house. In Casa Strela, you can book excursions and walking tours into nature, culture and history. 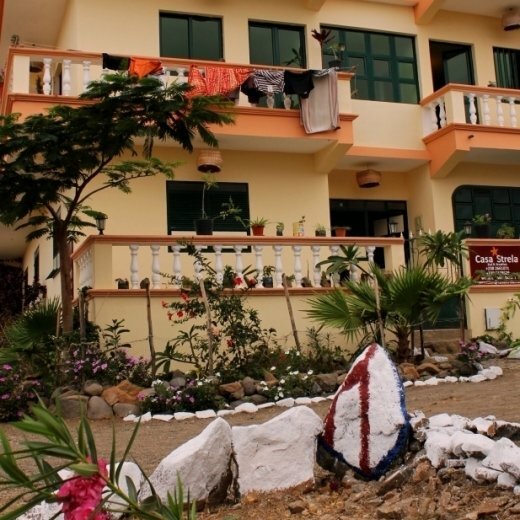 In addition, you can rent mountain bikes, surfboards and snorkel equipment. Our team will also arrange further sports activities for you like diving, fishing or kayaking. Location (approximate): Tarrafal, Ponta de Atum, north of the island Santiago, distance to the ocean: 130m, to Dive Center: 200m, to natural pool: 250m, to sandy palm beach: 800m, to center of Tarrafal: 700m, to Airport Praia: 71 km. Facilities: 4 double rooms, TV-Lounge, library, common kitchen. The roof terrace has an outdoor shower and BBQ, deck chairs and hammocks. The 4 rooms are of different size. One room is on the second floor and has a private bath/toilet and balcony. The remaining 3 rooms are on the first floor with shared bath (with bathrobes for everyone) and a separate toilet. Three rooms have ocean view, and all of them have safe, closet ceiling fan and reading lamp. Meals: Rich breakfast with fresh local products on the roof terrace with fantastic view to the Atlantic Ocean. 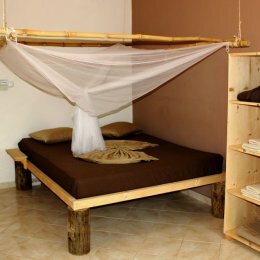 The Casa Strela is a easy, cosy, natural and rustic styled house at the atlantic ocean with some extras like Wireless Internet, hot water, great breakfast and good beds. The rooms are cleaned daily. Guests have the possibliity to cook in the common kitchen. The roof terrace is the meeting point of the B&B and a great place to get together with people from all around the world. The Casa Strela offers varios of Excursions, Sports and Activities like Hiking, Mountainbiking, Snorkling, Diving, Surfing, Fishing and more. The beautiful white sandy palmtree beach is about an 8min walk from the house. The divecenter is 200m far and in front of the house the surfers will have their fun.